Recent statements by politicians as well as grizzly managers and researchers in the Yellowstone ecosystem have revealed much about not only their motivations, but also the masters they serve. Official communications have been resoundingly and selectively silent about certain critical issues. At the same time, and more alarming yet, some managers and politicians have gone out of their way to tacitly incite violence and even criminality. But then, such behaviors are not new, especially on the part of Wyoming officials who routinely exploit controversies surrounding grizzly bear management to advance the interests of a regressive constituency. Much of the posturing, propaganda, and vitriol was unleashed in the run up to and aftermath of a ruling by Montana federal district judge, Dana Christensen, regarding the legality of the US Fish & Wildlife Service’s 2017 removal of Endangered Species Act (ESA) protections for Yellowstone’s isolated grizzly bear population. Judge Christensen ruled that removal of protections was, in fact, illegal based on several violations of the ESA, including failures in procedure, analysis, and treatment of invoked science. As a result, ESA protections were reinstated on September 24th, preceded by a series of two Temporary Restraining Orders, the first issued on August 30th, which prevented Wyoming and Idaho from proceeding with trophy hunts planned to begin September 1st. Since then, a storm of sometimes hysterical rhetoric has broken out, nowhere more so than in Wyoming. Perhaps one of the more egregious examples of tacit incitement and disrespect for judicial deliberations was on display during a recent meeting of Commissioners for Park County, Wyoming. The Commissioners vacillated among insulting Judge Christensen, displaying profound ignorance about the Judge’s ruling itself, predicting apocalyptic consequences arising from continued ESA protections, and speculating that “people” would start taking the law into their own hands—by killing grizzly bears. The last sort of remark could be viewed as simply an observation, but the tenor of comments by Commissioners such as Tim French came across as encouraging the very sort of criminality that he was anticipating—and malicious killing is criminal. There was also a disturbing tone of entitlement in remarks by Commissioners such as Lee Livingston, suggesting that simply because a small constituency of hunters and outfitters had been required to take reasonable measures for coexisting with bears, and prohibited from killing them at will, that the federal government “owed” them the opportunity to resume their old ways, including the profitable pursuit of outfitting grizzly bear trophy hunts. And it would be the outfitters who profit most from a hunt, not any of the state wildlife management agencies that would be charging a comparative pittance for grizzly bear hunting licenses. But conservative county commissioners were not the only ones tacitly encouraging the killing of Wyoming’s grizzlies under questionable circumstances. Officials from the state’s wildlife management agency were chiming in as well. Wyoming’s Chief Game Warden, Brian Nesvik, actively encouraged backcountry users to carry firearms for dealing with grizzly bear encounters, “9 mm and .40 caliber” or larger. The gun, of course, would cover instances such as when the pepper spray a person might be carrying “…fell out of the holster,” as apparently happened to him. “I can’t say when or where.” I suspect his gun wouldn’t have accidentally fallen out of a holster or, if it had, he would almost certainly have invested a lot of time and energy looking for it. In the end, though, Wyoming’s Chief Game Warden was deliberately promulgating a more lethal environment for grizzly bears entailing death under circumstances that are almost never thoroughly investigated; i.e., “defense of life and property,” which is invariably decided in the moment by the involved person, and by him alone. As a bystander, I find such comments to be insulting not only to a federal Judge but also to me as a fellow citizen and close observer of recent litigation. Having witnessed Judge Christensen as well as several judges before him in action, I have never seen civility, intelligence, or sincere deliberation comparable to what Judge Christensen exhibited. He did not reach his decision lightly; nor with any disregard for law or science. He knew full well the weight upon his shoulders. 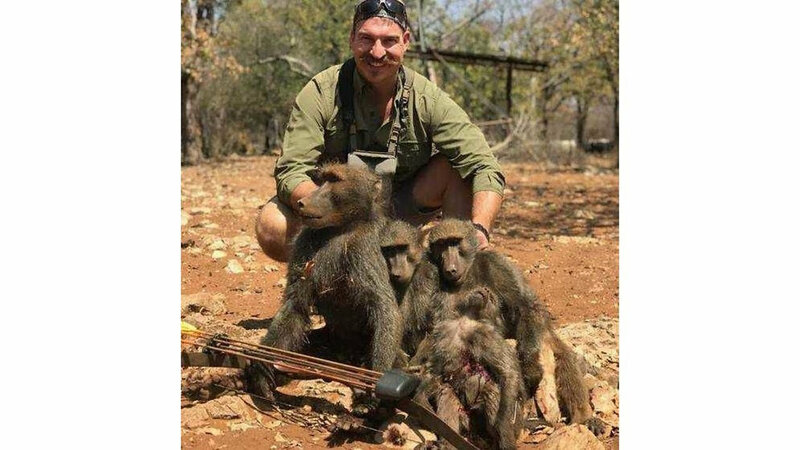 The “radical and unscientific” voices are not his, but rather those of rabid supporters for trophy hunting and state power. The private or semi-private statements of field-level wildlife biologists working for the states of Wyoming and Montana add foul-tasting frosting to this figurative foul-tasting cake. More than one wildlife biologist, including Brian DeBolt of Wyoming and Kevin Frey of Montana, has expressed to members of the public passionate hatred for those who oppose removing ESA protections for Yellowstone’s grizzly bears and returning authority to the states—especially those who are half-way successful in their opposition, including yours truly. I shouldn’t need to emphasize this point, but such statements to any member of the public, even in private, are grossly inappropriate on the part of a public employee. And yet such feelings and expressions are clearly condoned by higher-ups in regional state wildlife management agencies. 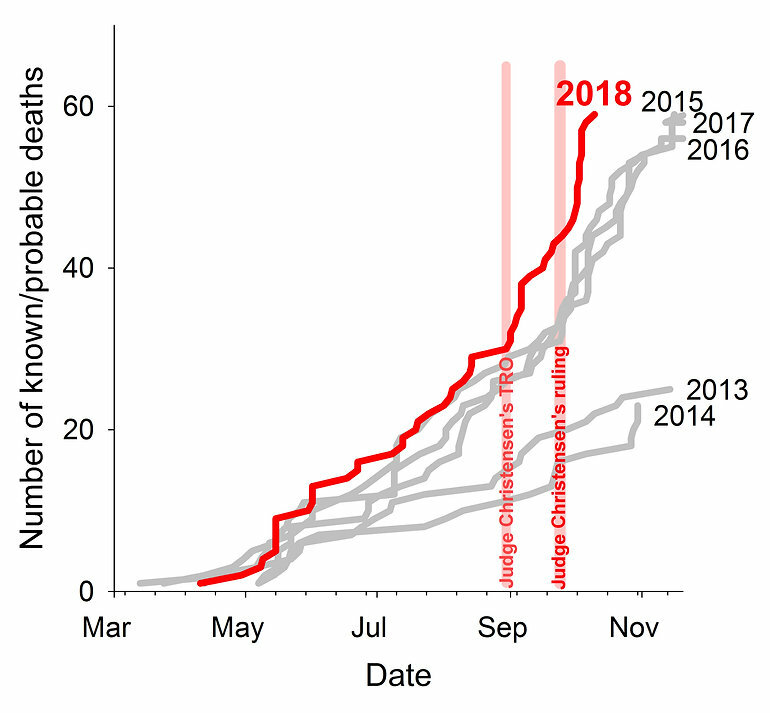 The companion piece to all of this pestilential negativity by especially Wyoming’s politicians and wildlife managers has been an echoing silence, ecosystem-wide, regarding a record-breaking pace of grizzly bear deaths during 2018. With one more month of hunting season ahead of us, during which yet more bear deaths are likely to be racked up, we are only 2 bears away from the year-end record total of 61 dead grizzlies set during 2015. This on-going trend is alarming. More to the point, it should be alarming to grizzly bear managers and a focus of their public outreach. But it isn’t. Moreover, this dead silence is in stark contrast to 2013 and 2014 when grizzly bear deaths were at temporary low ebb. During this hiatus, state and federal grizzly bear managers were making frequent triumphant proclamations about the success of management programs and, more to the point, the prowess of government managers. Relative to this din, the current vacuum is striking, as well as emblematic of how bear managers seemingly spin essentially every jit and tottle of information to maximum political advantage—specifically in support of divesting federal authority over Yellowstone’s grizzly bears to state managers. The reasons why are, in many respects, straight-forward but beyond what I can address here (see this article for more on governance of state wildlife management; this article for more on the ethics; and this article for more on a narrative driving FWS decision-makers). The most striking features of the pace at which grizzly bear bodies have accumulated this year are not just the unprecedented overall rate, but also the extent to which this rate accelerated immediately after Judge Christensen’s first Temporary Restraining Order and then, again, immediately after release of his final ruling. These jumps are clearly evident in the figure below in which the date-specific cumulative toll of dead bears for 2018 is shown by the bold red line and the benchmark orders by Judge Christensen denoted by vertical pink lines. Of course, in addition to these known and probable deaths, there are also the bear deaths we don’t know about, which typically add around 40% to the overall toll. The reasons why grizzly bears have been dying this year are also revealing. Prior to August 30th wildlife managers were slaughtering bears that killed or scavenged cattle, with removals for this reason accounting for 50% of the early-season total. This fraction dropped after August 30th to 14% of the total at the same time that “removals” by managers because of conflicts involving attractants near human residences increased from 10% to 36% of all deaths. But against this backdrop of bear deaths meted out by managers has been a sustained incidence of deaths “under investigation” (29% of the total to date), which has come to be a metaphor for incidents where somebody—often a hunter—killed a bear and afterwards claimed self-defense. A few are considered malicious at the outset by investigators, but the books are closed on most of these incidents based solely on the account offered by the involved people. Importantly, these sorts of bear deaths are consistently under-reported and hence often undetected by a factor of around two- to four-fold, which means that malicious and self-defense killings probably account for nearer 50% of the real total. It doesn’t take much imagination to divine what has likely been going on especially since August 30th in the backcountry and nearby human-frequented environs of Yellowstone. The correlation between Judge Christensen’s interventions in Wyoming’s plans for a trophy hunt and escalating bear deaths are just too striking—so much so as to defy mere chance. It also isn’t by chance alone that 86% of bear deaths so far this year have occurred in parts of Wyoming outside of National Park jurisdictions. Without being privy to peoples’ private motives, the most likely explanation for the unprecedented numbers of grizzly bears dying this year is that Wyoming’s wildlife managers, as well as a subset of backcountry users, are on a vendetta against grizzly bears. You could also call this revenge or grudge killing, but the phenomenon is ugly no matter how you describe it. And this probable vendetta has clearly been sanctioned—even encouraged—by Wyoming’s politicians, wildlife managers, and opinion leaders. This sort of thuggish behavior rooted in an impulse towards violence is insidious—with effects that are far-reaching. Most obviously, we have grizzly bears being killed in droves. But, in addition, officially sanctioned violence has an intimidating effect on people who might otherwise be vocal critics. Of direct relevance here, most spokespeople for local and regional environmental groups have so internalized this intimidation that they are now loath to speak out about the profoundly disturbing behavior of Wyoming’s officials on display in grizzly bear management—ostensibly for fear of eliciting yet more violence. This self-censoring and related timidity is self-evidently problematic for a healthy functioning democracy. A while back I wrote an article in which I explored whether Hillary Clinton’s ill-advised quip—that the majority of prospective Trump voters were “a basket of deplorables”—was supported by the available evidence. After wading through not quite a mountain but certainly a sizeable hillock of research and surveys, my conclusion was that the descriptor was resoundingly apt, especially so for the bulk of Wyoming’s voters and politicians. Moreover, a couple of tight deductive links suggested that “deplorables” was an appropriate descriptor for most of Wyoming and Idaho’s hunters and wildlife managers. The recent photo immediately above is of former Idaho Game & Fish Commissioner, Blake Fischer. He proudly posted this photo to facebook and then lamented he had done nothing “immoral or unethical” when confronted with public outrage. Photos such as this say just about all that needs to be said. For more on the culture of state wildlife management, see this article. If I had any doubts about this conclusion, they have been laid to rest by the acts and utterances of Wyoming’s officials and most of its big game hunters and outfitters in the lead up to and aftermath of Judge Christensen’s reinstatement of ESA protections for Yellowstone’s grizzly bear population. Even though there is always variance around the mean, the regressive perspectives and values of Wyoming’s residents are pretty damn obvious and pronounced, especially when it comes to management of large carnivores and treatment of those who advocate for these animals. Not only was Judge Christensen’s ruling defensible on legal grounds, it also potentially provided a reprieve from Wyoming and Idaho’s brutal regime for Yellowstone’s grizzly bears, as well as the people who care for them—but only if our federal managers authoritatively intervene to curb the lethal excesses of Wyoming’s wildlife managers and backcountry users. There are rationalizing arguments and related platitudes a plenty for not curbing the violent behaviors of ranchers and hunters—even officials—in places such as Wyoming. But at some point the only meaningful response to criminality and violent excess is authoritative action. Before that can happen though, the timid need to become less timid, and those with authority need to first take their head out of the sand and acknowledge the proverbial elephant in front of them. And then act.